The wild mountain blue huckleberry, or Vaccinium ovalifolium, is a true treasure of the Great Pacific Northwest. The stunning little blue berries are fit to be the crowning glory of any of Mother Natures golden tiaras. Not only are huckleberries a treat for the eyes, but when raw they have a delicious sweet- tart taste that will leave you wanting more. When cooked into syrups or baked into pies, they have a tantalizingly pure and rich flavor all their own that has been a popular staple among countless American families for generations. 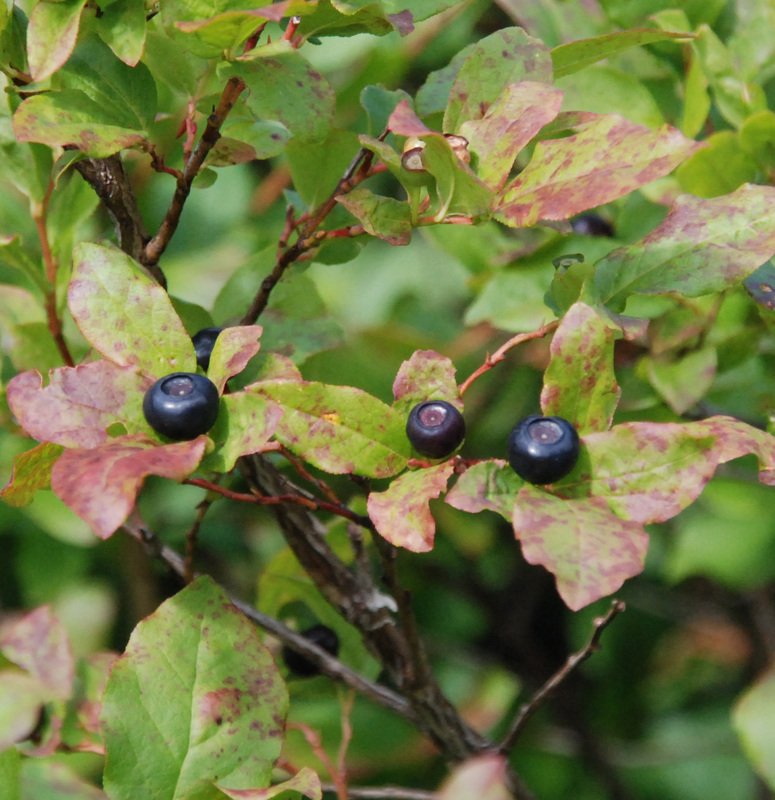 The huckleberry is so beloved that the term ‘I’ll be your huckleberry’ came to mean ‘I’m the right person for the job’, and aslo as a term for a significant other. As if the aforementioned statements weren’t reason enough to go out and get yourself some wild huckleberries, they are also incredibly healthy for you. With An ORAC score of 111, these berries rank among some of the most antioxidant rich foods in the world. This means that per cup consumed they pack a much healthier punch than most all other foods and have excellent anti-aging, anti-cancer and pro immune system properties to help both fight off and prevent a plethora of health issues and diseases. The wild mountain blue huckleberry is a perennial evergreen shrub that usually ranges from 2-3 ft tall but can reach as high as 10. It has 1/2 to 1 1/2 inch serrated leaves that start out red-bronze but turn bright green in the Summer months. During the Spring, small pale pink flowers appear throughout the shrub which give way to small, round blue-black berries in the Summer. The berries are popular with everyone from foragers, to birds to bears, with everyone reveling in the tastiness and healthiness of the berry. The wild mountain blue huckleberries grow in acidic mountain soils at elevations from 2,000 to 11,000 ft. They can be found all the way from Alaska to Washington and Oregon, to Idaho, Montana and Wyoming. In recent years crops of wild huckleberries have been difficult to find due to the fact that winters have been mild and there has not been much of a snow pack to protect the huckleberries during the winter months. Mild Winters, coupled with earlier Summers recently has meant that often many berries are dry before foragers can get to them. Fear not however! This year there seems to be an excellent snow pack in the mountains which leads us to believe that huckleberry season will be very fruitful! So get your hiking boots on… Or go to www.nwwildfoods.com! Makes one 8-inch Wild Blue Huckleberry Pie! Mix the above ingredients together with a spoon so that everything is well distributed; pour into the bottom pie shell as it sets in the pie plate. Dot the top of the mixture with 2 or 3 dabs of butter. Top off with the second pie shell. Once it is correctly positioned you should have a 1 inch overlap on the top crust so that it can be crimped with the bottom crust. Crimp or pinch the two crusts together and make a decorative edge to seal the two pie crusts. The pie can be refrigerated until you are ready to bake or baked immediately. To bake, preheat your oven to 450 degrees. Place the pie on the middle shelf of your oven and bake for 15 minutes then turn the temperature down to 350 degrees and continue baking for 30-40 minutes or until the filling starts to bubble over. Once the pie looks done and the crust is a light golden brown, it should be done. Take it out and let the pie cool on a cooling rack until it is ready to serve. Some notes: baking your pie may take less time or a little longer depending on your oven. Just in case it starts to bubble over the side, place a sheet under the pie plate to save cleaning the oven. Our simple Wild Huckleberry Sauce makes a delicious topping for ice cream or cakes. Enjoy! In a medium saucepan combine ingredients and stir until smooth. Bring to a boil, stirring constantly and cook for 5 minutes at a gentle simmer. Serve hot or cold.